At some of the areas in Raja Ampat, there are some location where we can find soft corals and sea fans dominated, others are also about hard corals, seagrass beds, mangroves, shallow reefs, drop offs, caves, black sand, white sand and thousands species of fishes. The high marine diversity in Raja Ampat is strongly influenced by its position between the Indian and Pacific Oceans, as coral and fish larvae are more easily shared between the two oceans. Raja Ampat's coral diversity, resilience, and role as a source for larval dispersal make it a global priority for marine protection. Coral reef ecosystems are the potential for coastal and marine resources which are prominent in the Raja Ampat Archipelago, especially around the small group of islands. 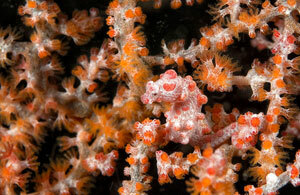 The Archipelago is located in the 'Coral Triangle' which in the 'heart' of diversity of coral reefs of the world with all the associated biota within, such as various types of reef fish, mollusks and crustaceans. There are about 540 species of hard coral, including 13 endemic species (about 75% of coral species in the world), and more than 1070 species of reef fish and 60 species of crayfish. Moreover, there are 699 softbone species of animal and species of mollusks, which consists of 530 snails or Gastropoda, 159 shellfish (Bivalva), 2 Ccaphoda, 5 squid (Cephalopoda), and 3 Chiton, made Raja Ampat archipelago as small island region with tremendous marine biodiversity and the high productivity of fisheries of a high economic value.